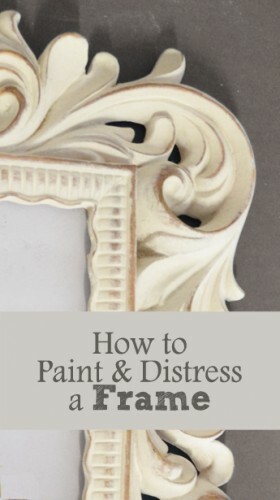 Ornate frames with lots of detail are perfect for painting and distressing. I check Goodwill pretty regularly and have been able to come across a few cute frames. To paint and distress them, here are the steps..
1. Sand – I just use a piece of sandpaper (220 grit) and sand the whole thing thoroughly. It shouldn’t take too long. You want to take away any shininess, but you don’t need to sand past the stain or remove all the stain. Just a light scuffing is good enough. Then clean it thoroughly. I use windex, but water might be good enough if you did a thorough job sanding. I just go over it with a wet washcloth and remove all dust. 2. Paint – I’ve been able to find some good, small painting brushes that are great for painting frames at Michael’s crafts. JoAnns fabrics might have a few too, I haven’t checked there. I would do 2 coats of paint. You can use chalk paint, milk paint or latex paint. 3. Sand – Once the paint is fully dry, use a piece of sandpaper (220 – 320 grit) and go over the whole frame, make sure you allow the wood underneath to show through in the detailed areas. Try to smooth out any imperfections too. Then, clean the whole frame with a wet cloth. 4. Clear Coat – Like furniture, you can clear coat with wax or polyurethane, depending on the look you want. Wax would be applied with a cloth or wax brush and polyurethane (or polycrylic) would be applied with a brush. 1-2 coats should be enough. You don’t have to do a clear coat. You might want to skip this step if you like the look without it. The clear coat will just add an extra layer of protection and shine.